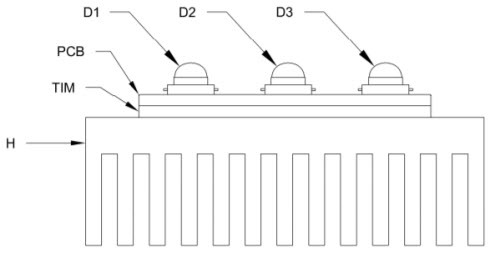 In order to achieve the expected reliability, lifetime and optimal performance of LEDs, especially for high-power LEDs, appropriate thermal management is of the utmost importance. One of the key parameters for good thermal management is the temperature of the active semiconductor layer designated as the junction temperature. The manufacturer’s recommended maximum junction temperature should therefore not be exceeded during operation, in order to prevent damage to the component. Ideally, the junction temperature should be kept as low as possible for the given application. Due to the design principle of the LEDs, the junction temperature of the LED can not be measured directly. One of the most critical design parameters for an LED illumination system is the system’s ability to draw heat away from the LED junction. High operating temperatures at the LED junction adversely affect the performance of LEDs, resulting in decreased light output and lifetime. To properly manage this heat, specific practices should be followed in the design, assembly and operation of LEDs in lighting applications. Thermal management is becoming more important as the density of electronic components in modern printed circuit boards (PCBs), as well as the applied power, continues to increase. Both factors lead to higher temperatures of individual components and of the entire assembly. However, every electrical component in an assembly has to be used within its prescribed operating temperature limits due to its material properties and reliability aspects. 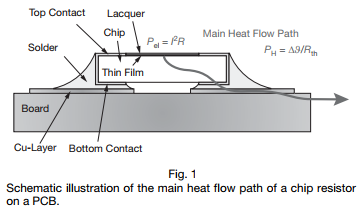 In this application note, experimental results are provided in order to prevent overheating of electronic devices such as surface-mount resistors. Listen to the amateur radio bands long enough, and you’ll likely come to the conclusion that hams never stop talking. Of course it only seems that way, and the duty cycle for a transmitter operating in one of the voice modes is likely to be pretty low. But digital modes can up the duty cycle and really stress the finals on a rig, so this field-expedient heat sink for a ham transceiver is a handy trick to keep in mind. This hacklet comes by way of [Kevin Loughin (KB9RLW)], who is trying to use his “shack-in-a-box” Yaesu FT-817 for digital modes like PSK31. Digital modes essentially turn the transceiver into a low-baud modem and thus messages can take a long time to send. This poses a problem for the 5-watt FT-817, which was designed for portable operations and doesn’t have the cooling fans and heavy heatsinks that a big base station rig does. [Kevin] found that an old 486 CPU heatsink clamped to a lug on the rear panel added enough thermal mass to keep the finals much cooler, even with a four-minute dead key into a dummy load at the radio’s full 5-watt output. You may scoff at the simplicity of this solution, and we’ll concede that it’s far from an epic hack. But sometimes it’s the simple fixes that it pays to keep in mind. However, if your project needs a little less seat-of-the-pants and a little more engineering, be sure to check out [Bil Herd]’s primer on thermal management.